Amazing. Chaotic. God-blessed. Those words summarize my experiences as a first-time “missionary” from Bethel Lutheran Church (LCMS) in Saint Paul, Minnesota, to Cat Lake, Ontario, courtesy of the Lutheran Association of Missionaries and Pilots (LAMP). We left our church with a beautiful sending service involving children in our own VBS program. We drove from St. Paul to International Falls, where we entered Canada, then continued north to Sioux Lookout, a total distance of 469 miles. 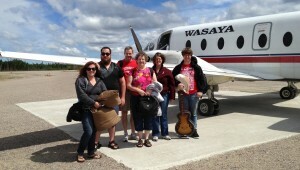 From Sioux Lookout we flew 112 miles north to Cat Lake. Touching down on the town’s gravel runway, we were driven to the Anglican church building — used primarily for funerals — which would serve as our VBS headquarters. We walked through the community handing out flyers inviting residents to encourage children in the community to join us on Monday afternoon for Bible stories, crafts, and games. 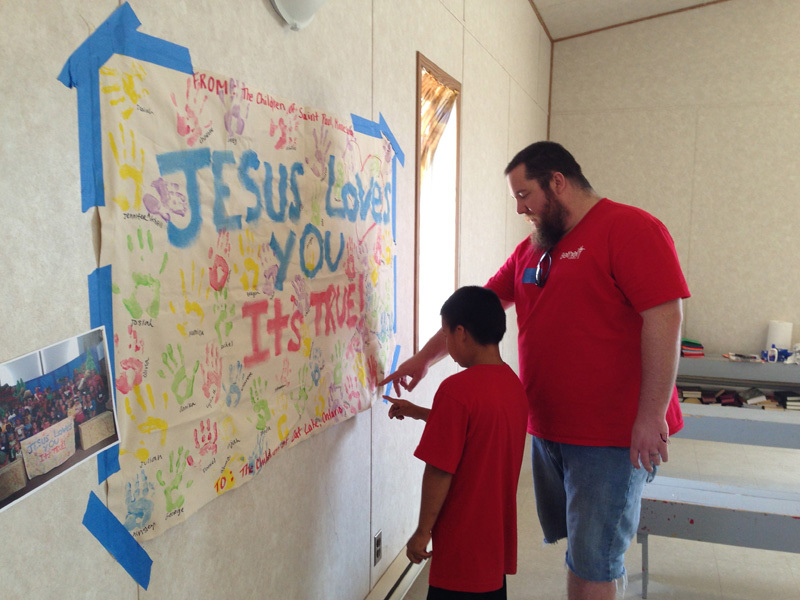 Jordan Ray (right) shares a banner painted by the children of Bethel Lutheran’s VBS with one of the children from Cat Lake’s VBS. We prepped the church for VBS activities and held an impromptu worship service in the evening. Three community residents joined us, and together we sang hymns, read scripture, offered prayers, and praised God. We met Donnie — responsible for the community’s small radio station — and interrupted regular Ojibwe programming to share an invitation to VBS with the community. Thirty-two children joined our first VBS session, learning that “God Promises to Love and Care for His Children.” Our lesson included the story of Noah, creating Fruit Loop rainbows on paper plates, and holding a three-legged “enter-the-ark-two-by-two” race. The day’s lesson, “God Has a Perfect Plan for Each of Us,” was based on God’s promises to Abraham. The message was timely, but our day “a disaster.” Everything that could go wrong did. And yet … God was still at work. After supper, Gary (not his real name), a 30-something leader in the village, unexpectedly visited us. He explained that he was a relatively new Christian who was questioning if God loved him despite his sin. The conversation provided the perfect opportunity to remind Gary of God’s grace and forgiveness in Christ. We told him that God sees Christ’s righteousness when looking upon the children of God. We prayed with Gary and thanked God for bringing us together. Today’s lesson was “God Promises to Save His Children from Their Sins.” It was based on Numbers 21 (poisonous snakes in wilderness; bronze snake on pole). The story foreshadows Christ’s sacrifice on the cross. 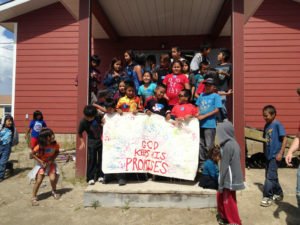 Forty-six children participated in the day. During its Vacation Bible School week, the children of Cat Lake, Ottawa, learned about God’s promises. They “painted” their handprint on a banner with that message, which volunteers from Bethel Lutheran Church (LCMS) in St. Paul brought back to that congregation’s children. Both the craft — a clay snake on a chop stick — and the outdoor game — “snake tag” with children wearing socks over their arms playing the role of snakes — were big hits and reinforced the message that God hears us when we call out to him for salvation. We again concluded our evening praying for the specific requests included in our prayer box. Today’s lesson was from Isaiah 7, “God Promises the Savior, Jesus.” The kids were fully engaged in the craft of the day — making “Baby Jesus in a Manager” through the creative use of toilet paper rolls, shelled peanuts, tissue paper, markers, and straw. Later that evening we also were greeted by Ellen, our band host. Traveling with Ellen was her 12-year-old grandson, whom we had asked to “be a leader” in our VBS program. Could this be a future church leader in training? We pray it will happen. Though it drizzled throughout the day, we hosted a community feast (a picnic hot dog lunch) prior to VBS. Our feast introduced the day’s lesson, “God Promises That All Who Believe in Jesus as Their Savior Will Live with Him Forever in Heaven.” The lesson was based on Jesus’ words about the great feast from Luke 14:15-24. We reminded the children that God’s feast offers life — forever — with Christ. We then said goodbye, finished packing and cleaning, and headed back to the airport, where we reversed our original travels and arrived home in Saint Paul on Saturday morning. Our team gives God the glory for allowing us to sow God’s word among the children of the village. The needs of the village are great, but God is at work. We look forward to returning to help teach and encourage Cat Lake children and adults to put their hope in Christ. Thank you, LAMP, for giving us this opportunity. 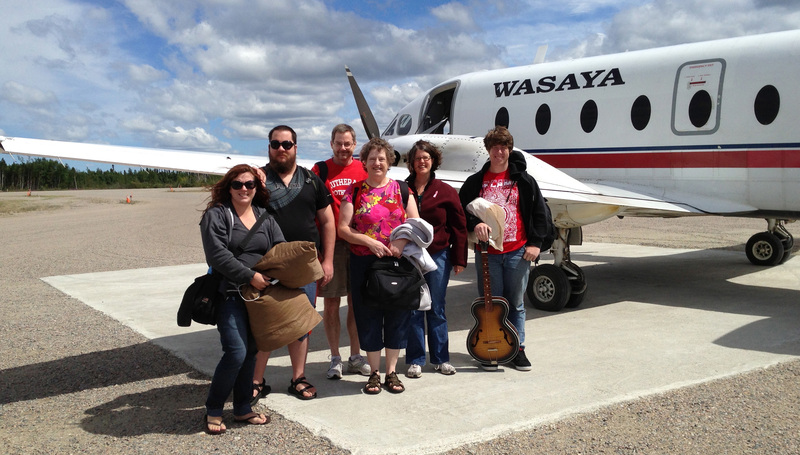 Dave Rustad, a member of Bethel Lutheran Church in St. Paul, offers journal reflections on his recent experiences on a LAMP mission trip to Cat Lake, Ontario.